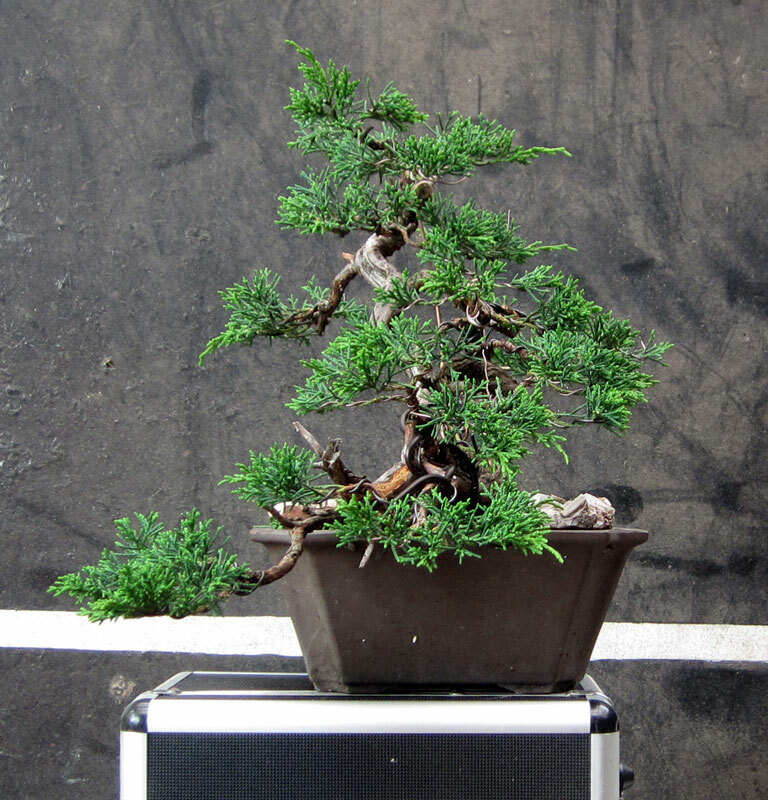 You are currently browsing the category archive for the ‘Bonsai Maintenence’ category. As the season rolls on I am slowly getting to the end of my needle work which in turn will mark the time to begin preparing the deciduous trees for winter. 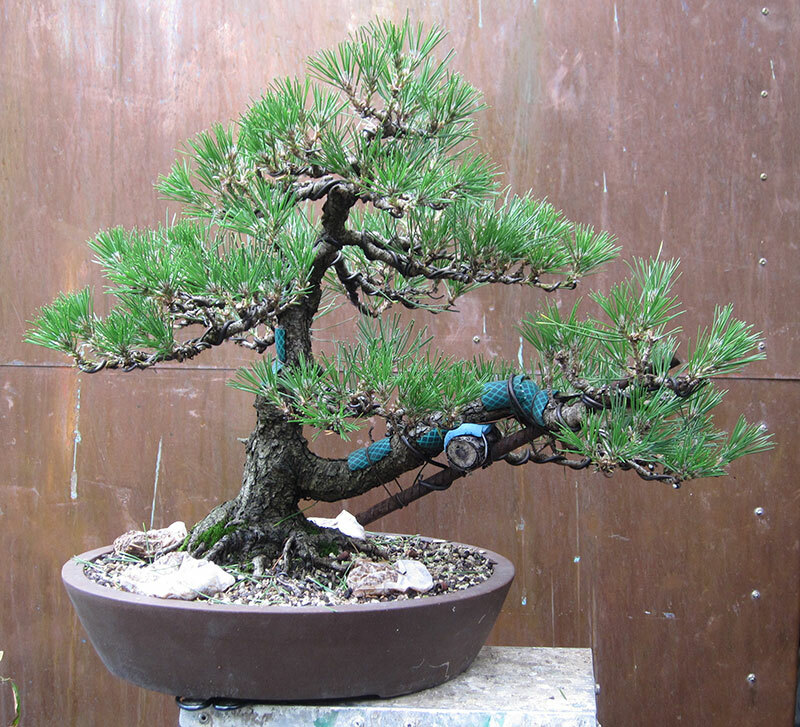 The tree below is another that has been slowly developing over the years and with another wiring and another years candle pruning I think it will be close to exhibit-able. The tree has appeared on the blog before HERE where you can see the progress it has made and the ramification it has gained. It also makes obvious just how much it needs a re-wire. After a the needle plucking. Yet another of my trees that desperately needs a re-wire, it will have to get into line behind all the others that I plan on doing this winter. This weekend gone by I got some time to do some needle work on a few more trees. One of which has featured on this blog before. It’s a bit of a strange tree and people either like it, or want to cut off the first branch. I like the first branch and as a result i haven’t cut it off just yet and actually now the tree is filling in a little bit more I am beginning to like it more than I did at first. 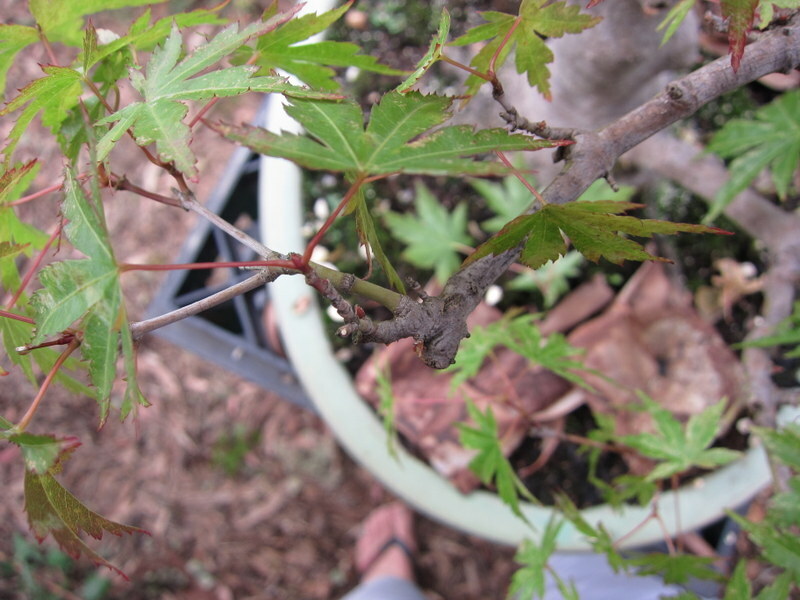 Probably the part of blogging I am enjoying the most is how it has forced me to catalogue my trees as they progress. If you look at this tree 2 years ago HERE you can see that the tree has really improved over that short time. Looking at it day to day on the benches it is easy to lose perspective and feel like the tree is not progressing. It is only when you see a picture from a year or two ago that you realise just how much it has changed. Needles removed revealing nice, new, short growth. I am very happy with the progress I have achieved with it over the last couple of years and hopefully if I can keep this momentum up for a few more the tree will be well on the way to being exhibit-able. I doubt if this tree is ever going to be everyone’s cup of tea but I think that it is now on a path where it will grow into a convincing image. Its been a good year for growth in my garden which is always a bit of a double edged sword. A good seasons growth means that all your trees will have progressed and built further to their structure, ramification etc. but with lots of growth comes lots of maintenance. With my pines this work takes longer and longer times. As the trees ramify the number of shoots double each year in turn doubling the time it takes to maintain them. 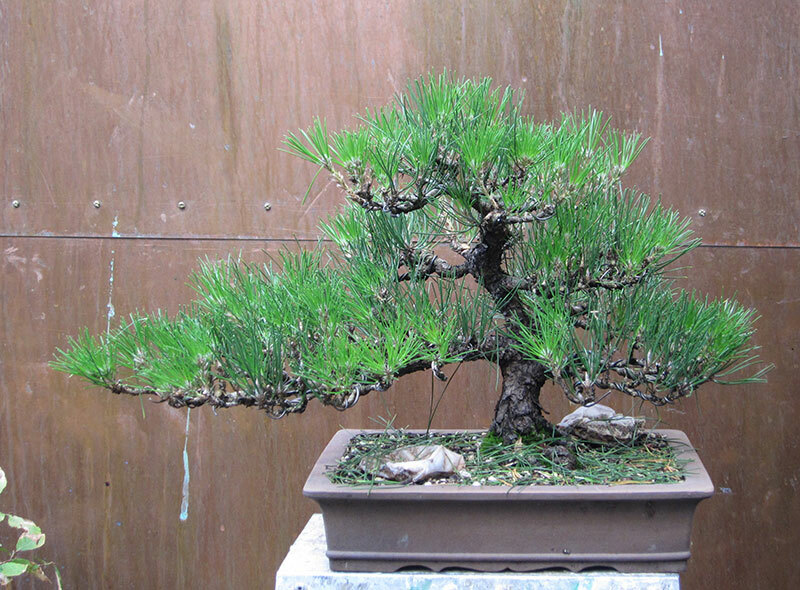 As trees become more dense fingers can no longer reach areas of the branching so tweezers are employed which again can slow things down a little. Here in Australia we are beginning to slip into autumn and it is time to shoot prune the second flush of growth and do needle work on the pine’s remaining growth. 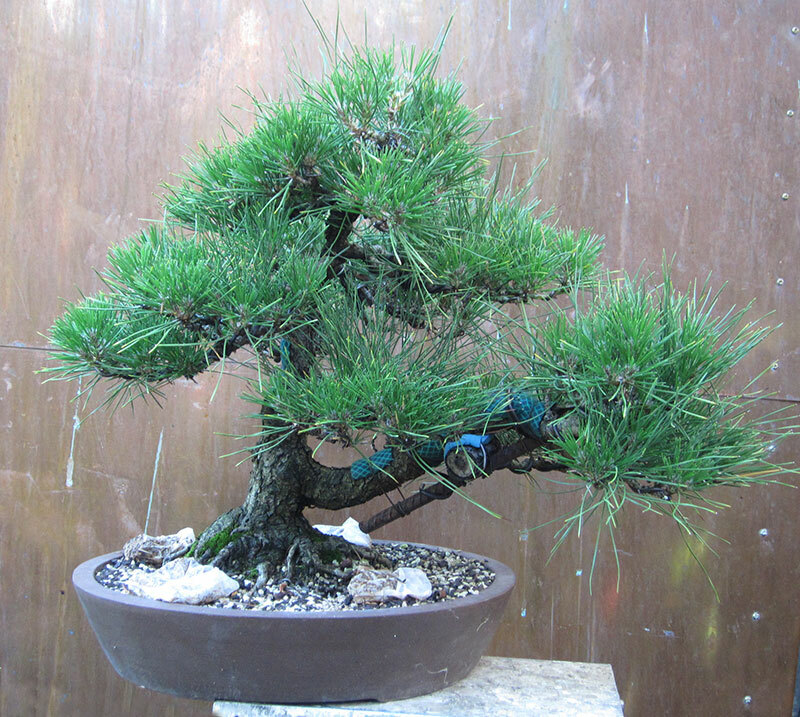 The first tree off the bench was THIS little black pine. 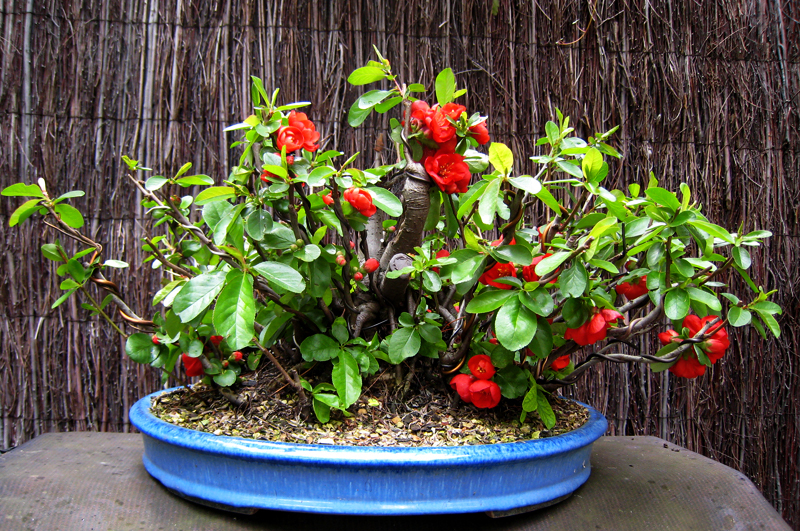 Finally it is beginning to look like it belongs in a bonsai pot. you can see in the before picture how nicely the needle length has come down compared to the long needles attached to candles that were not pruned in spring due to them being weak. 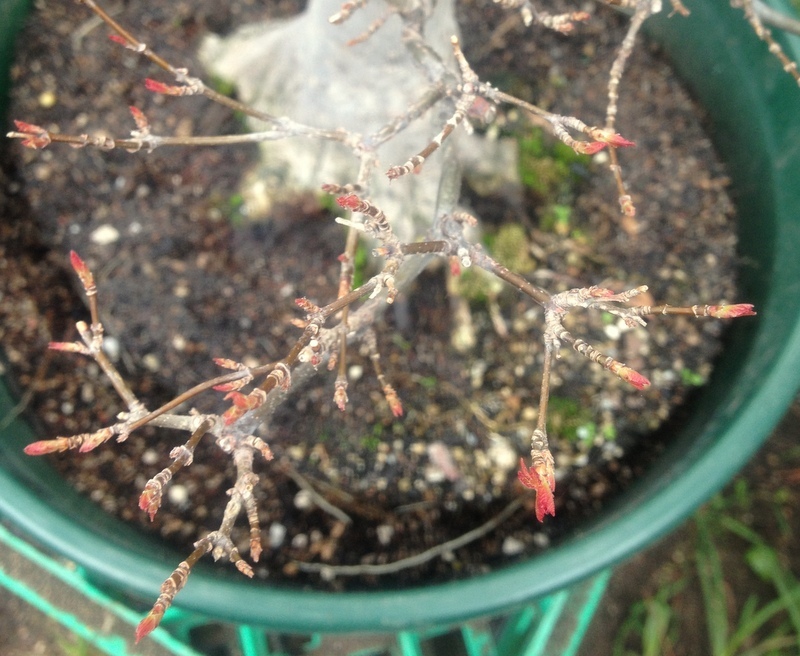 These weak candles now have strong buds at their tips getting ready for next springs flush. After a few hours work things begin to look a whole lot neater. The new length of the needles is much more suited to the trees size and over all the tree is beginning to look more in proportion. 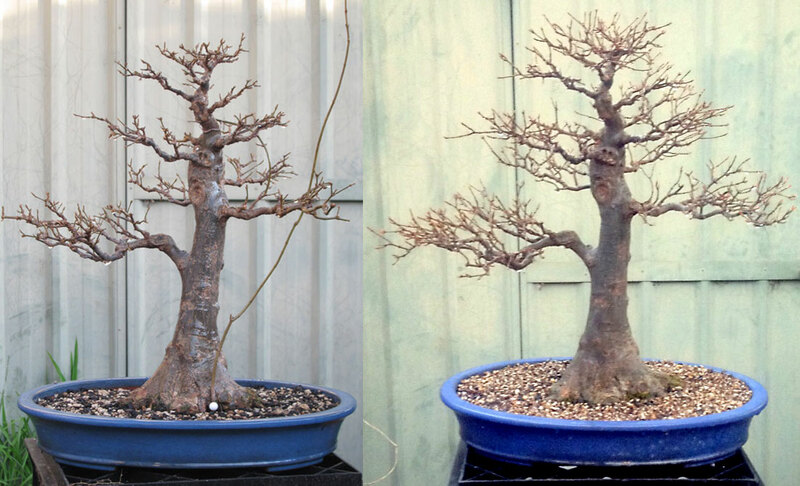 Next step is a re-wire which I hope to complete some time this winter and then a re-pot into something a bit nicer. Nebari, incorrect techniques and their results. 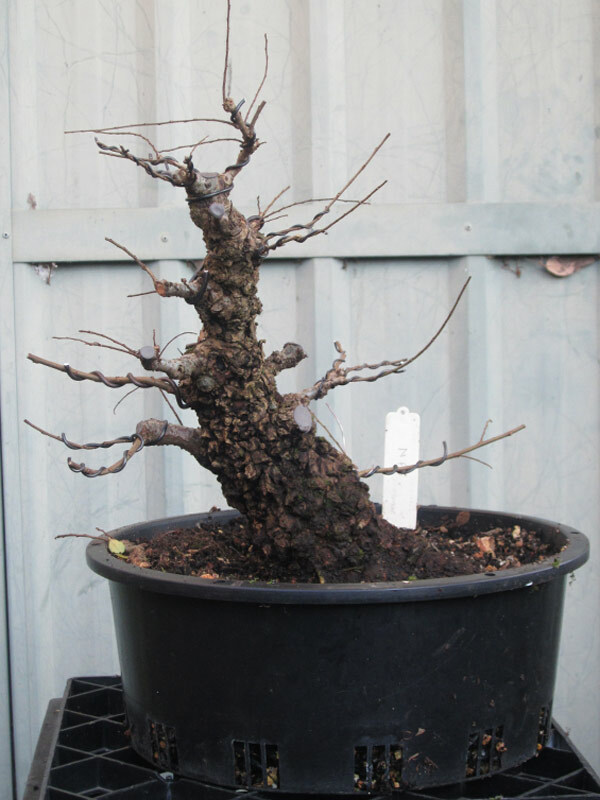 I have had a number of old deciduous trees go through my collection over the years. Often they arrive in various states of neglect or dis-repair due to ageing owners, lack of interest or lack of knowledge. What has been interesting is the results of this lack of technique and or application. I think most people are aware of what they should be doing. 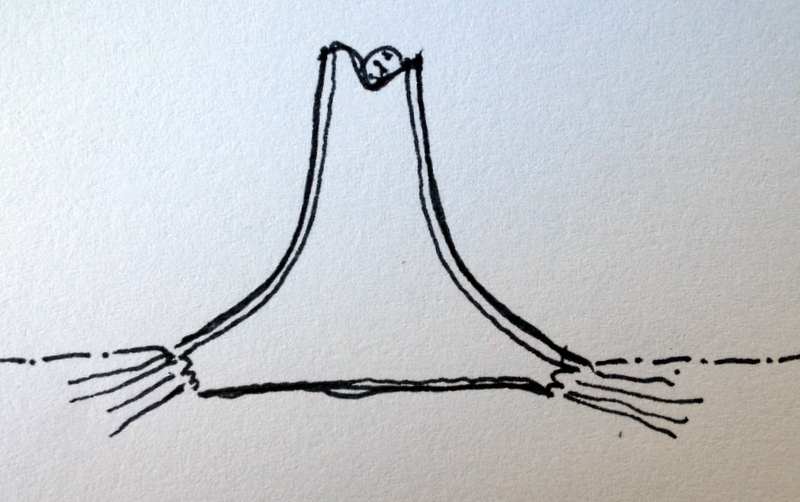 Most beginner books say something along the lines of “cut all downward growing roots off to form a flat root-base”. In essence that is correct. But why? Is it to get the roots to fit in shallow containers? Partly yes. Is it to encourage a flaring nebari? Partly yes. There is one more reason that is rarely discussed or talked about when talking about root work. 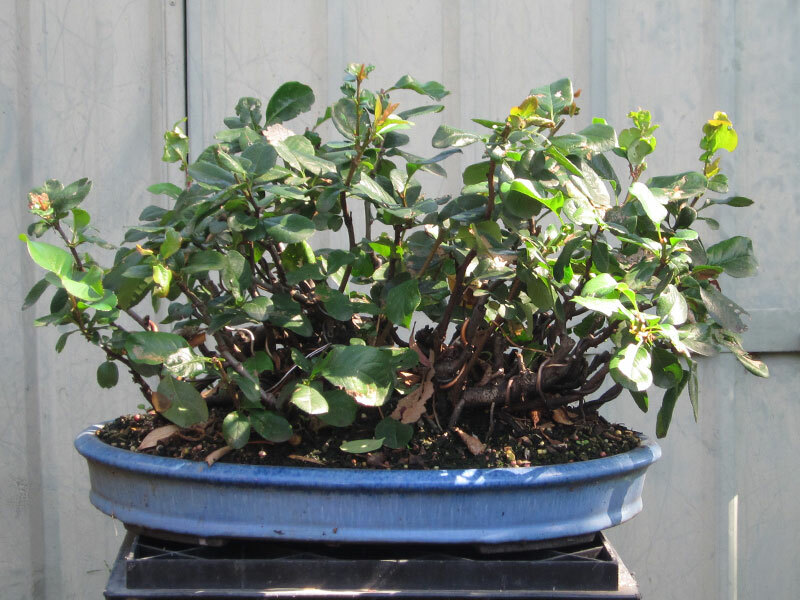 What we want roots to do in a bonsai container is counter intuitive to the plant we are growing. 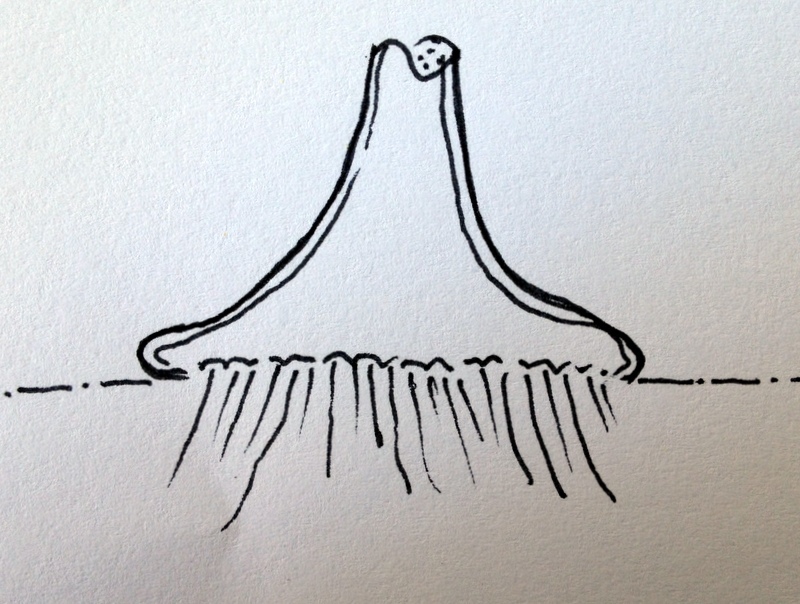 We want a shallow root system close to the soil surface. This area of the soil profile is horticulturally the worst place in the pot to grow roots, and here in lies the problem. The top few centimetres of soil are those most likely to experience temperature changes and drying out, both of which are no good for roots. Yet this is the area of soil we need them to occupy to form a good shallow root-base. 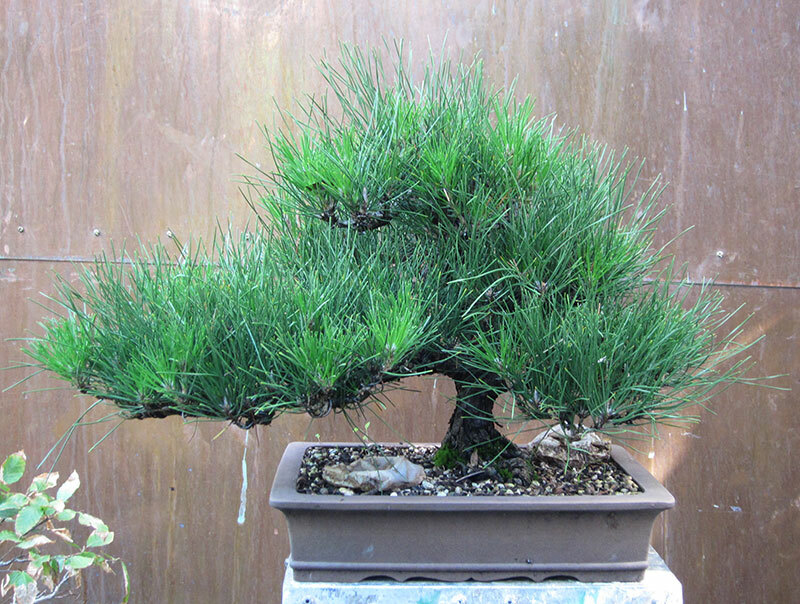 The above image is a vertical slice through the center of a well-formed nebari.The hairs on either side are roots and the triangluar shape is the nebari and lower trunk. 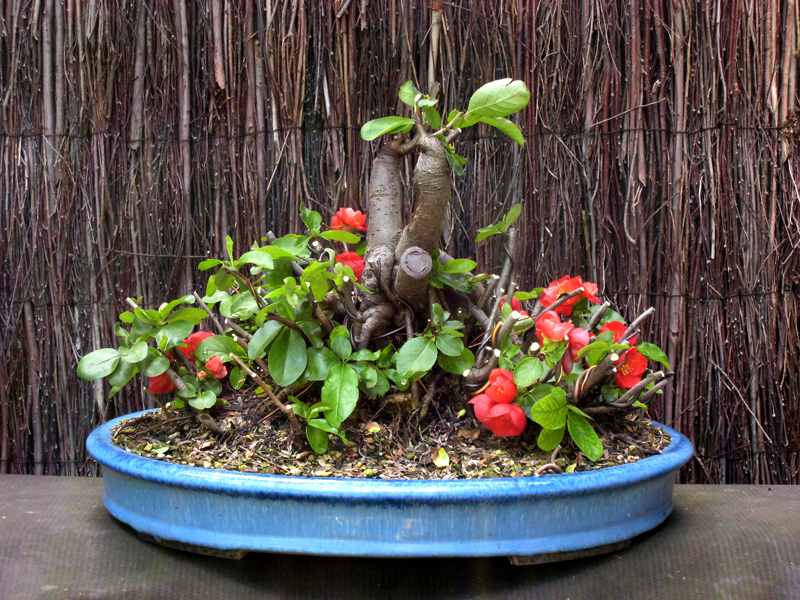 Idealy you want roots on the outside radius of the root base so that as the tree grows the nebari slowly gets larger. These roots however are occupying a zone that is not ideal for them. In order to keep them active in this zone you must force them to stay there. To do that you remove all downward growing roots. These roots are more protected under the trunk and head straight for the cooler more temperature and moisture stable soils lower down in the pot. 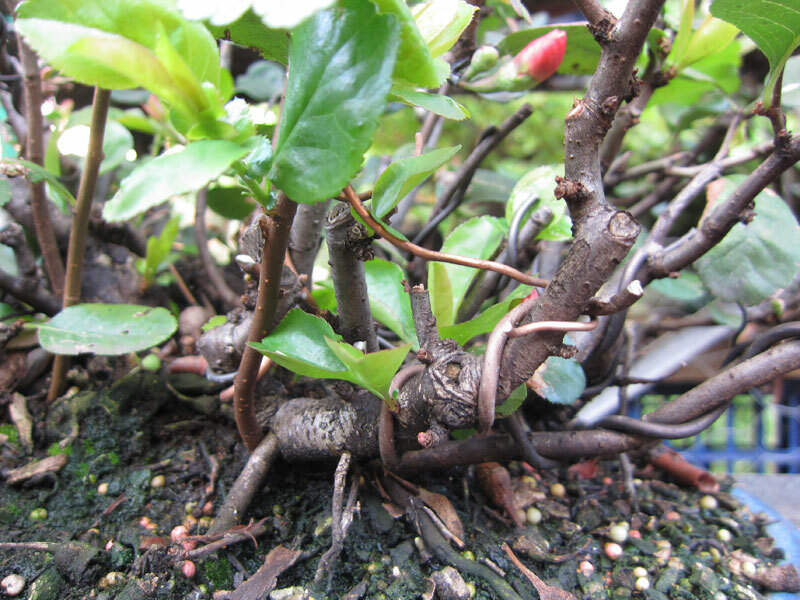 If you leave them on year after year the bonsai will preference these downward growing roots which are in better horticultural locations and the roots you actually want to keep around the edge of the nebari will slowly start to die back. Incorrectly pruned root base result. What you end up with is something like the above drawing (this shows a tree which had a well-developed nebari and was then incorrectly maintained). All the roots on the edge have died back and only roots underneath the trunk are growing. 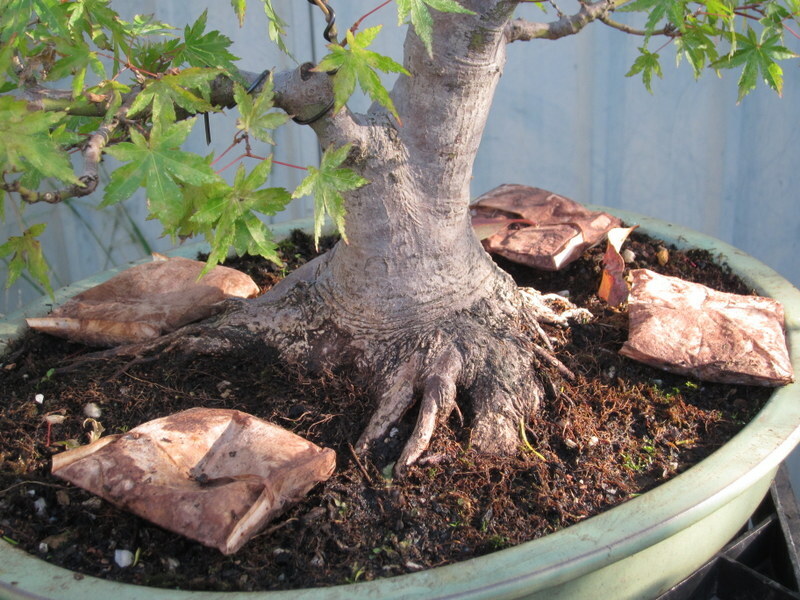 Now the nebari will not grow in size around the edges but instead grow underneath the trunk and slowly make the root base less and less shallow requiring deeper and deeper pots to house it. 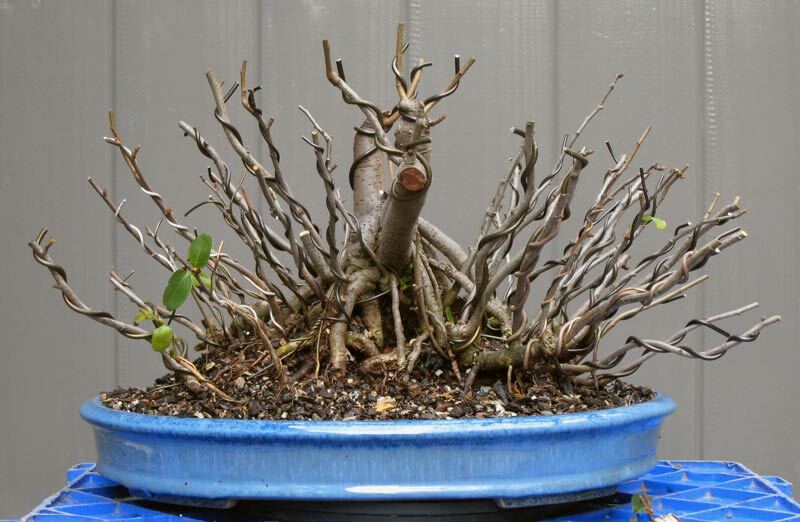 These downward growing roots often push the trunk up and show the edges of the nebari so that it appears somewhat like a blob of melted candle wax. Not ideal. Not natural. 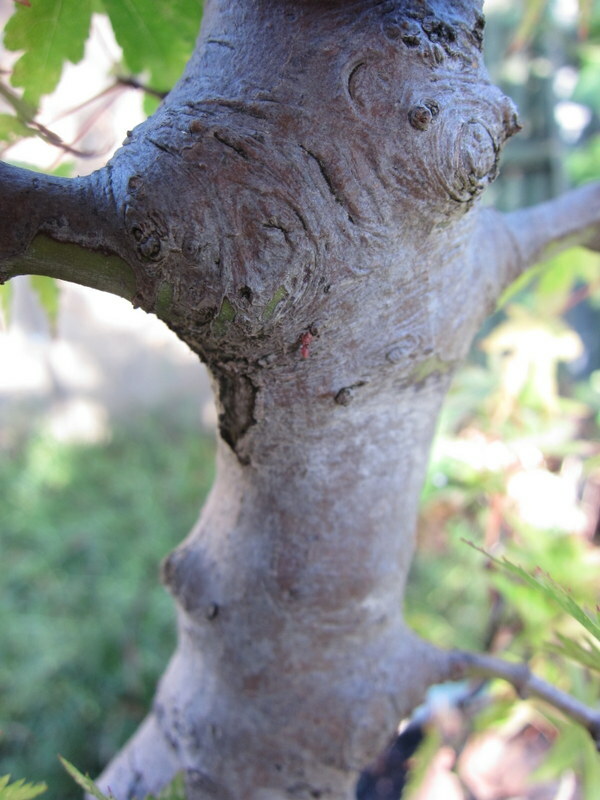 If left in this state for a long time the edges of the nebari can begin to develop areas of dieback that will often spread from the edge of the nebari up toward the trunk. All in all a bad result. So if you have deciduous trees that are beginning to form nice root bases be sure to ALWAYS take off the downward growing roots. 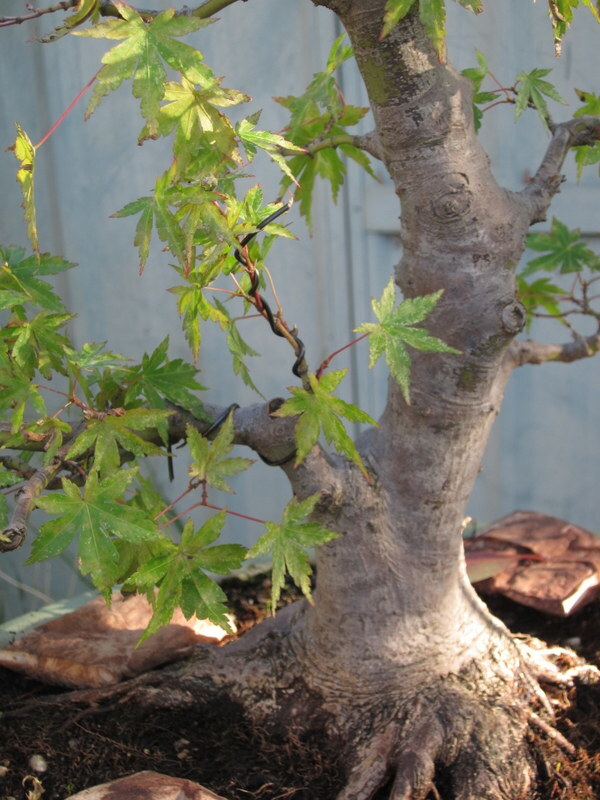 It is not just to fit the tree into the pot but it is mainly to ensure your roots grow where you need them to and this will keep your nebari developing correctly well into the future. I am continuously telling myself I have enough trees and that I need to reduce the collection. 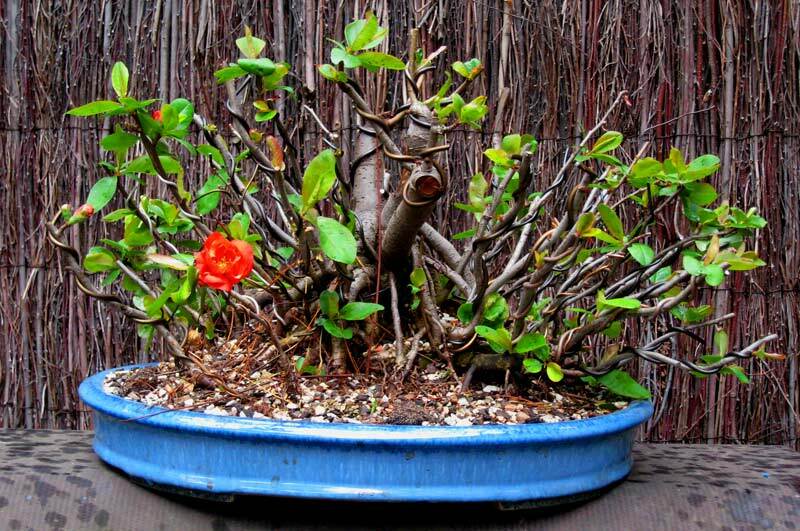 Well, that only works so well, much like the tree that is the topic of this post, bonsai keep finding their way into my backyard. I saw this maple at a local show last year and while talking with the owner, he let me know that it may be for sale sometime in the future. To cut a long story short, I bought the tree early this year and it has since sat on my benches while I got to know it. A few things drew me to the tree initially. The tree had age. 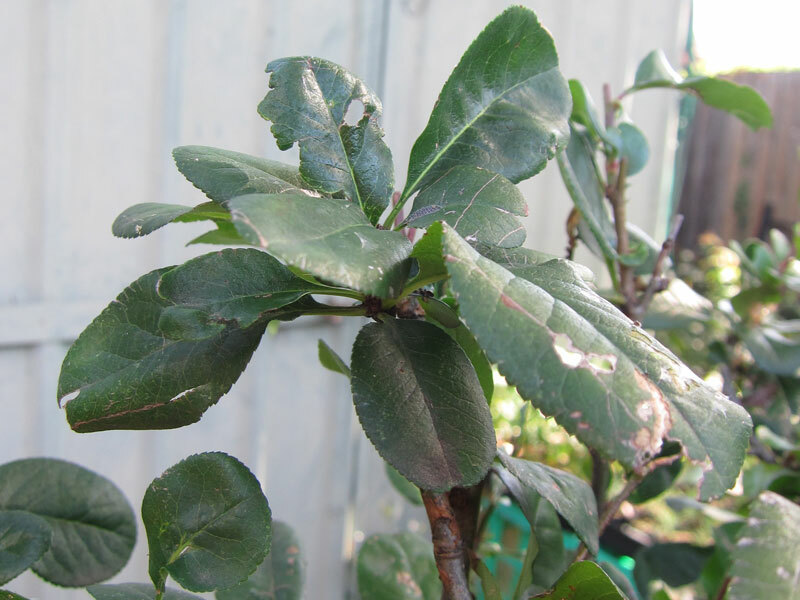 Old grey bark is a sign that the tree has been around for a long while and cannot be achieved via short cuts. The nebari was another feature that drew me to it as it was really starting to flare nicely at the soil level. This is a really nice feature that can only get better with future work as I develop the rest of the tree. Since it arrived in the garden, I have fed it, watered it and tried to work out what my plan for its future might be. It has responded well and even survived a large gum tree branch falling onto it. It took two people to lift the branch off but luckily all the trees under it survived with only a couple of small broken branches. Very lucky. Today I decided that I would start the tree’s re-styling. I first cleaned the nebari and removed the surface moss. For this I used an old tooth bush and clean water. Old tooth brushes really come in handy for this type of work. 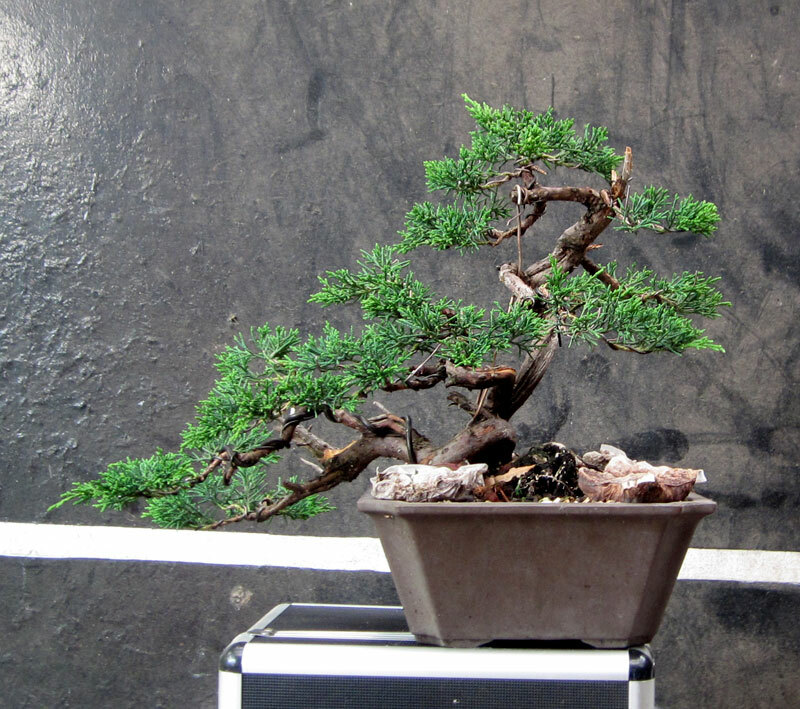 I then cut off the heavy apex and replaced it with a small branch below. 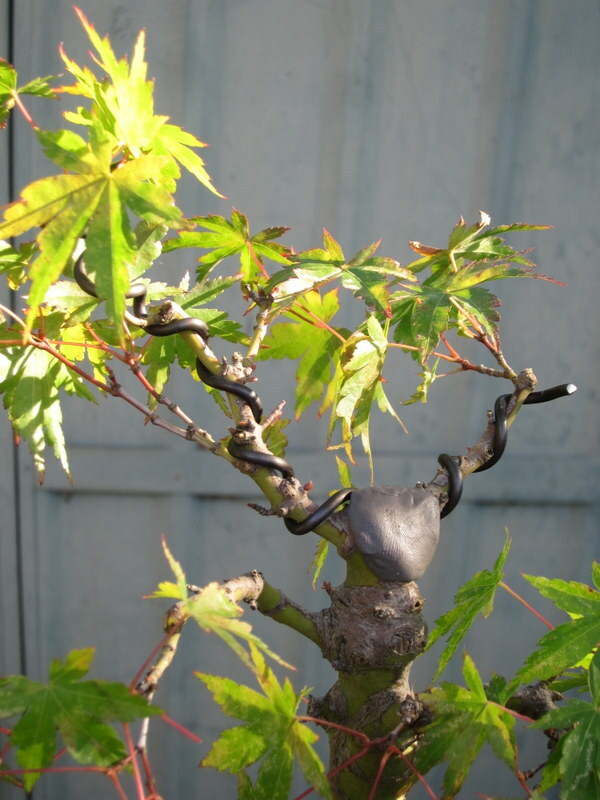 The apex pruned back and a small branch below wired into place. On a couple of the larger cuts I trialed using two cut pastes at once. First I applied a liquid paste from a tube. I like this type of cut-paste but it tends to soften and wash off during extended periods of rain which is why I applied a second layer of cut-paste putty over the top as a waterproof layer. I also like the putty on it own but I find it sometimes dries out too quickly and or doesn’t seal as well as the liquid tube style pastes. Hopefully this will give me the best of both worlds. 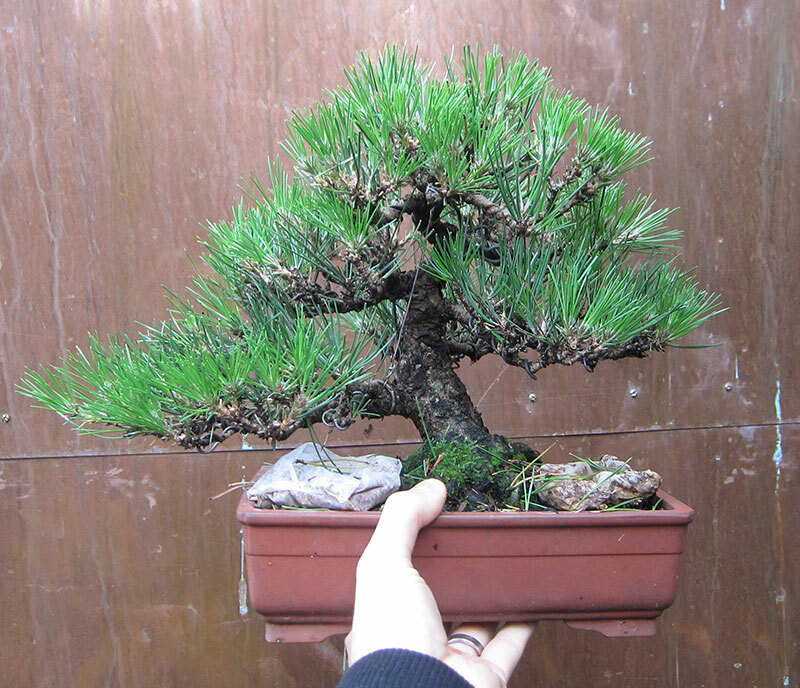 Another double cut-paste pruning cut. I know there are those out there who don’t believe in the use of cut-paste and are quietly smiling away to them selves at my overkill, but without starting a debate on the issue, I have tried using cut-paste and not using cut-paste and at least where I am living it seems using it gives better results than simply leaving the wound to its own devices. 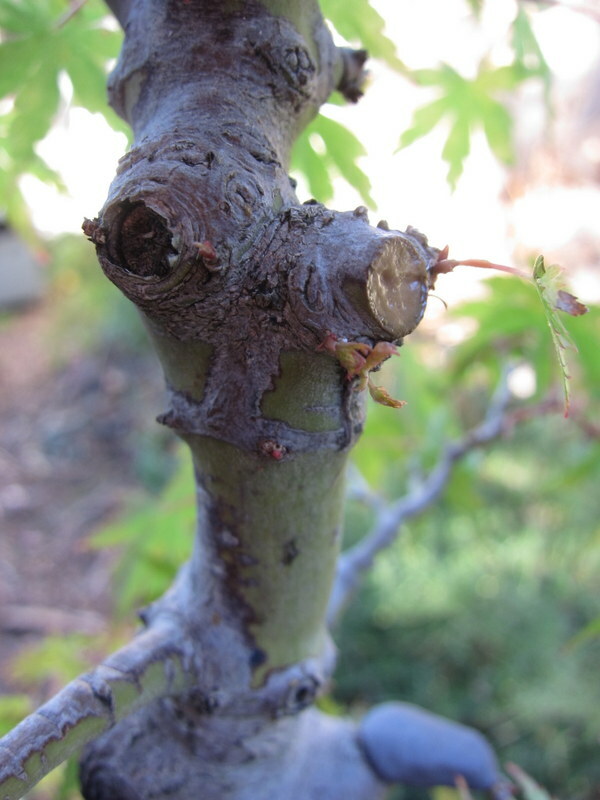 After removing the apex it was time to address the areas of the old branches that had thick growth at their tips and or sections where too many buds had been allowed to grow and knuckles had formed. When faced with this type of issue the only solution is to cut out the offending growth. It does seem like you are setting the progress of the tree back a little as you are removing some of the visual bulk of the branch but down the track you will end up with a branch with much better structure and a far superior winter image. Thick twigs at the tips of the branches look heavy and take any idea of grace away from the branch structure. So I cut out the offending areas. 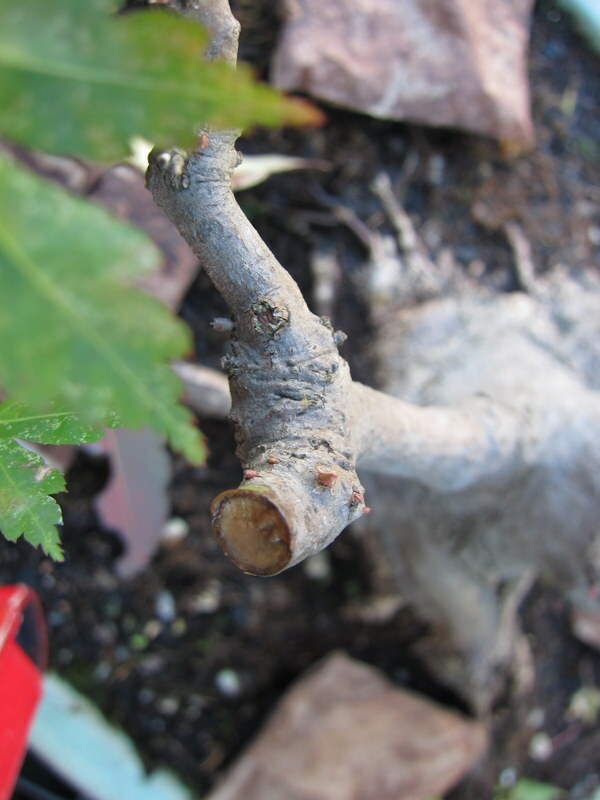 I will re-build the fine tips with the back budding that the pruning will no doubt trigger. Since the tree had been on a heavy feeding program it has begun to show results. 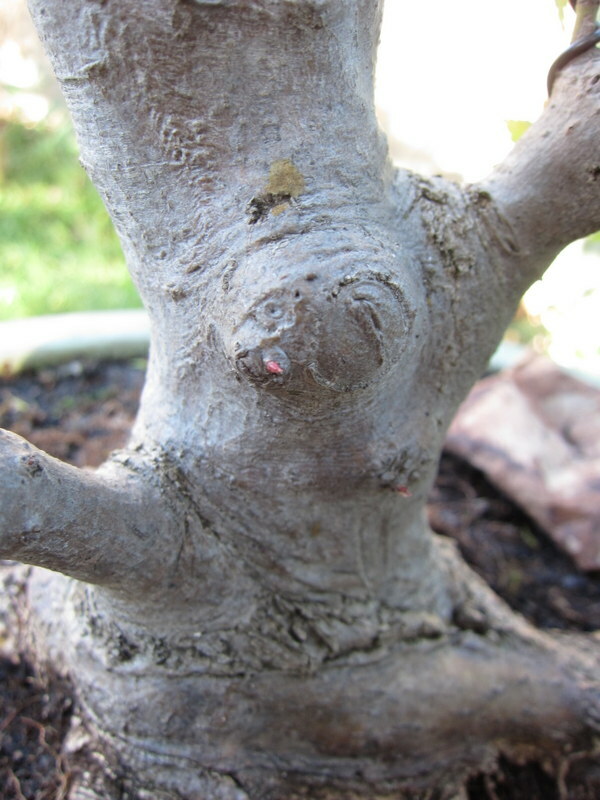 Buds have already started to swell along the branches and the trunk which makes me confident that the pruning will continue to trigger new buds for future ramification. Interestingly some of the buds that woke up along the trunk were almost at soil level and on really old bark. 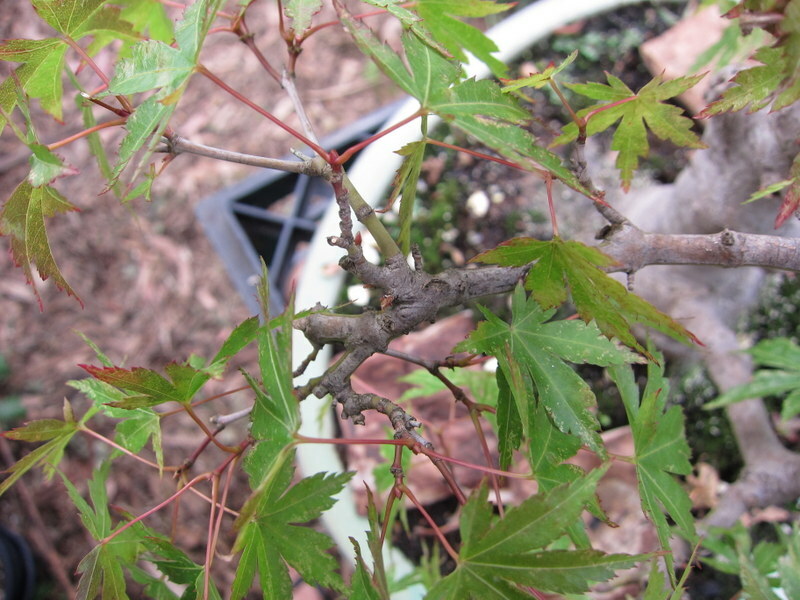 There are buds at the base of most branches or former branches. Some buds low down on the trunk on old wood. 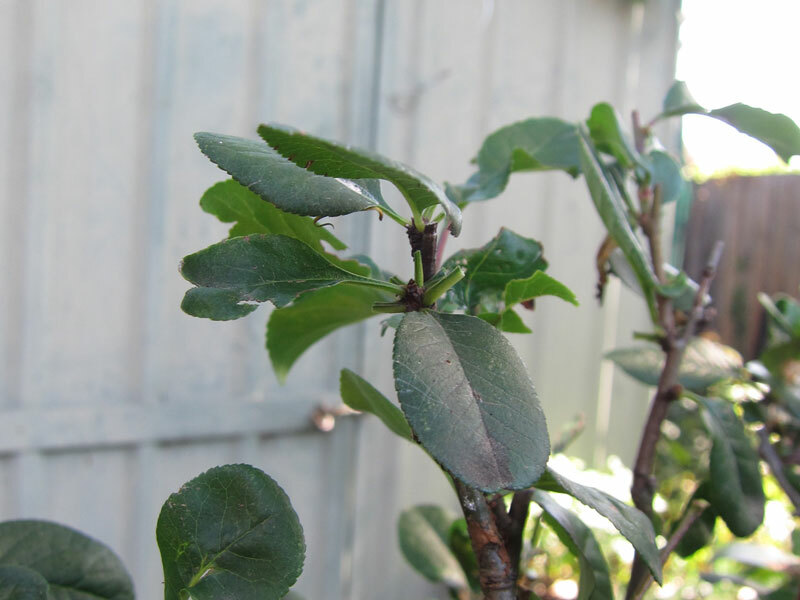 Buds at the base of a branch damaged by the falling gum tree branch. 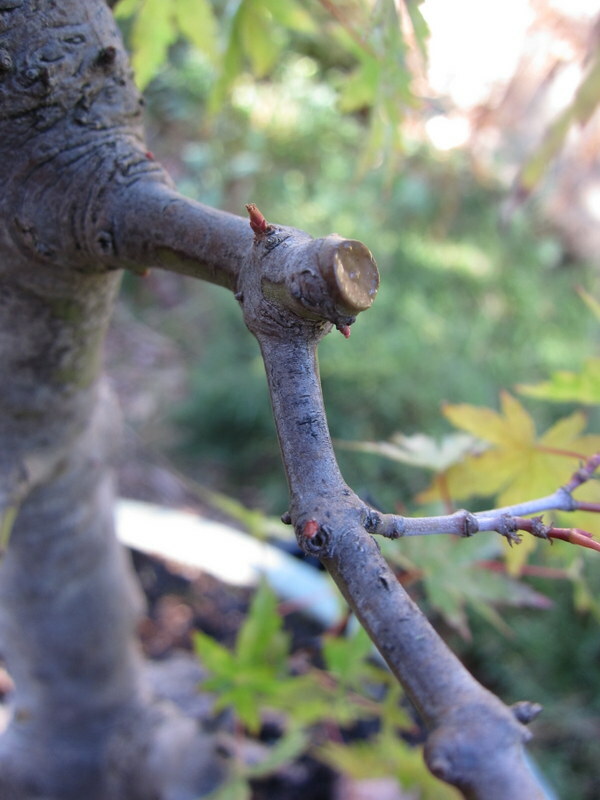 It’s easy to prune large branches when you know they will be easily replaced by buds at the base. I think the tree had previously been on a very low dose and or no dose feeding program. This meant that when I started to flood it with fertiliser it literally started jumping out of its skin (or bark) with back-budding. I imagine next season this will only be amplified once it is re-potted into a fresh mix and the compacted roots get some space and start to run a little. After correcting a few of the structural issues I had a think about the future style of the tree. I decided that the trunk line would be complimented nicely with a second trunk. As it turned out I had a small branch in just the right position at the base of the first branch to wire up into the new trunk. This will be left to grow free for the next few seasons to thicken and elongate. A useful branch wired up into its new role as second trunk. After doing work such as cleaning and structural corrections you get a good idea of the trees faults and features which makes for a nice way to ease into re-styling. In this case it made the decision of changing the front easy. The old front had a root that had grown across the root-ball and fused a long time ago creating a slightly awkward look when viewed from that side. 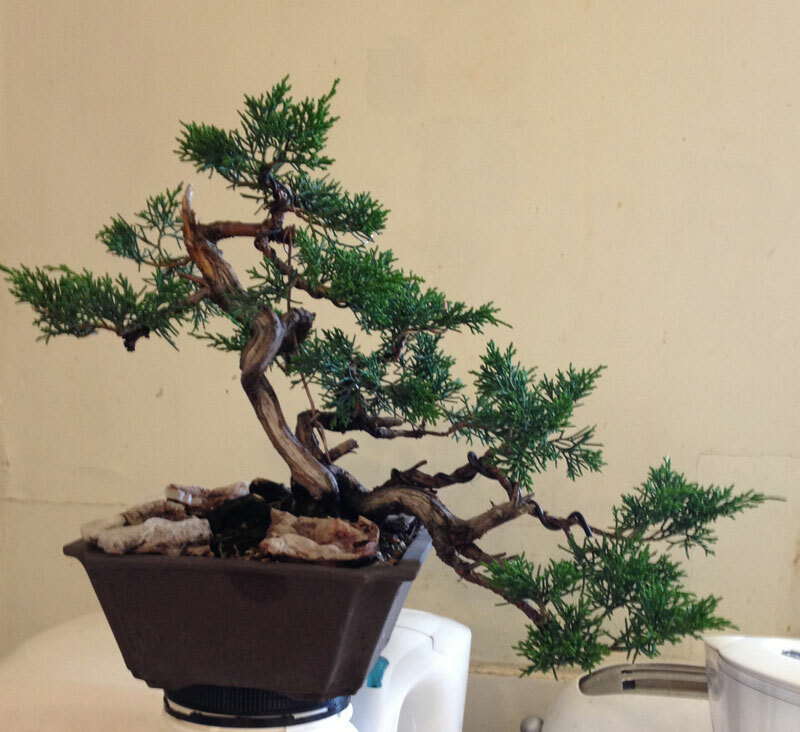 The Back of the tree showed a much nicer nebari and the now left first branch exited the trunk from a much nicer angle. The newly wired up apex gives the appearance of much nicer taper and adds a little movement from this new front as well. After the work. A little bare for now but the bones are all there to make a very nice tree in the future. For now the tree will be fed and left alone until re-potting time early next spring. 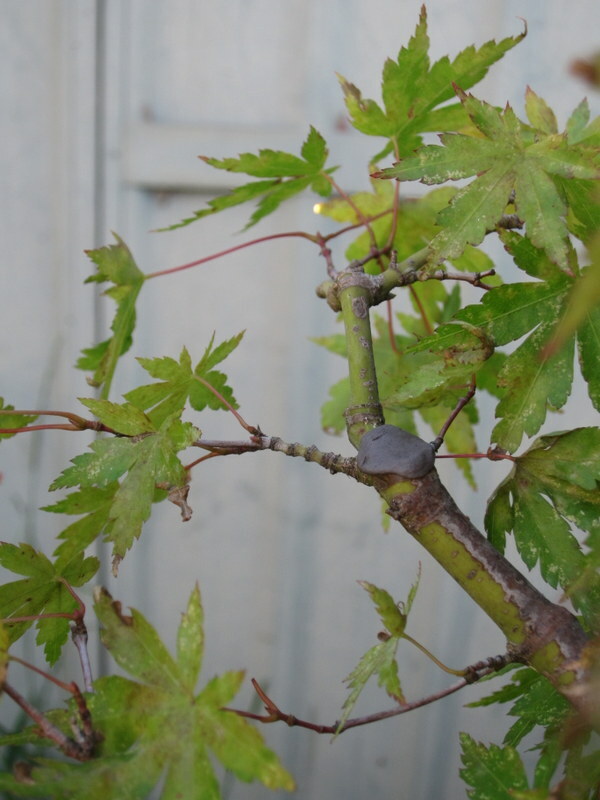 Then after the first flush of spring growth hardens off I plan to fully wire the tree and any new growth that has developed from the buds that are forming now. I am really looking forward to getting into the root-ball and seeing what it looks like under the soil and where I can make improvements. It has the start of a fantastic nebari and it will be fun taking it and the rest of the tree to the next level. Re-potting this year has been a rushed affair where I have been doing it when ever I have time. Mostly this seems to be under garden lights after work. Spring seems to be a little early this year which hasn’t helped as the schedule has had to be brought forward. Having said that, I have nearly got through all my trees. I have a handful left to do that I hope to get done this coming weekend. As i have been in a rush there hasn’t been much time (or good light) to take many pics. Most of the re-potting I have been doing has been fairly un-interesting anyway and mainly just renewing of soil and replacing the trees into the pots that they came from. 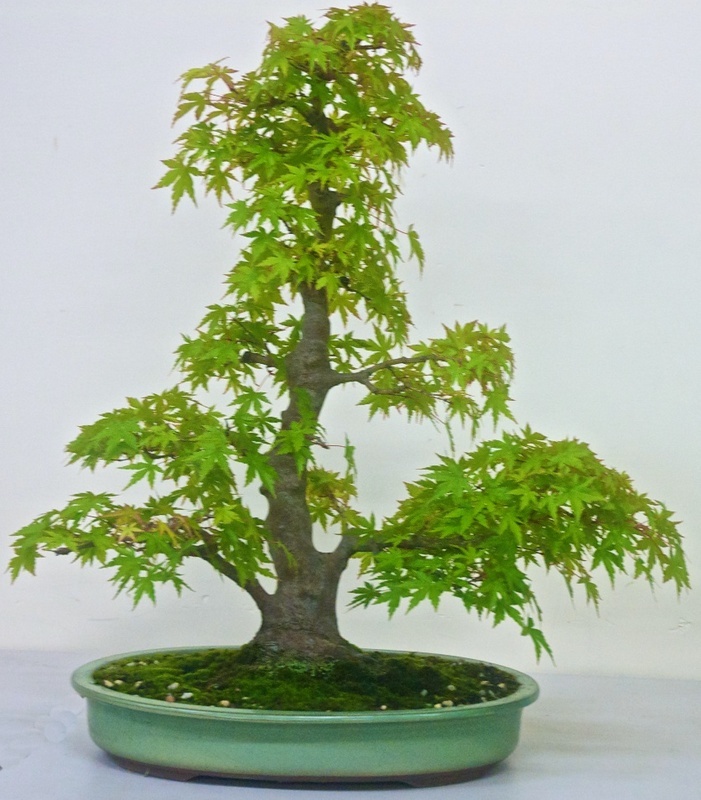 One tree I did get to do during daylight hours was a trident maple. The pics i took were with my phone to see how that would work out and as you will see they are fine in good light (see the buds pic) and not so great when the light was getting low when i had finished re-potting the tree. I talked about this tree with Boon while he was in Melbourne and also Hirotoshi saito. They both thought that the tree should be rotated slightly to the right. I had been tossing up whether or not to do this for some time before speaking to them but their advice made me decide to go ahead and try it. I am glad I did. A small tweak such as this 15 degree turn makes a lot of difference. Left: the tree in August 2011. Right: the same tree, August 2012. The reason I had been debating whether or not to make this change lay in the nebari. 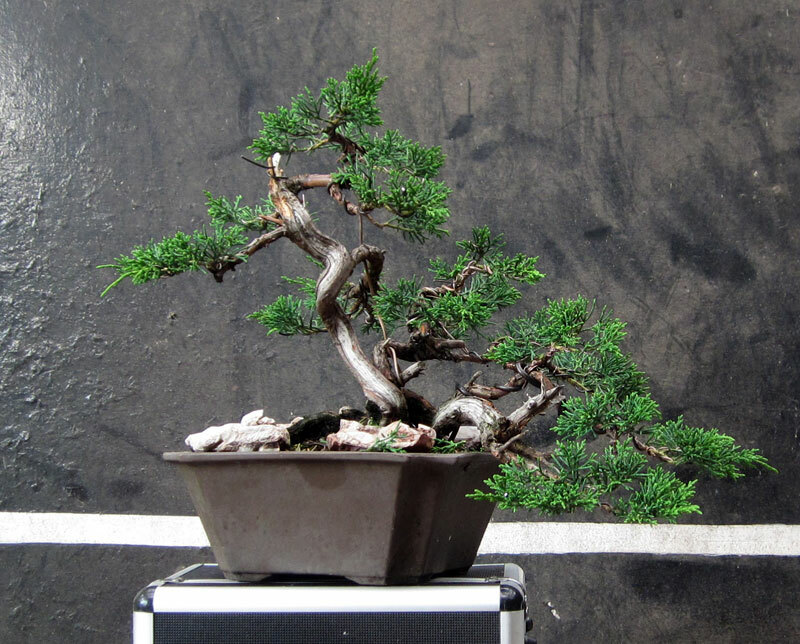 In the 2011 picture you can see that the nebari’s spread has a somewhat flat side to it which was facing the front. When it was rotated this formed an angle which is a little strange although there are a few good results of this change. First the slight thickening about 2/3rds of the way up disappears and there is more movement in the trunk. Also the branching is better from this new front. I also tilted the tree forward a little. this moved the root ball a little and raised the soil in the rear of the pot a bit. I will correct this next re-potting once the roots re-establish themselves in the new position. I think i will also try to move the tree a little more to the right, i shifted it a bit this year but having seen the photos i think it could move over some more. 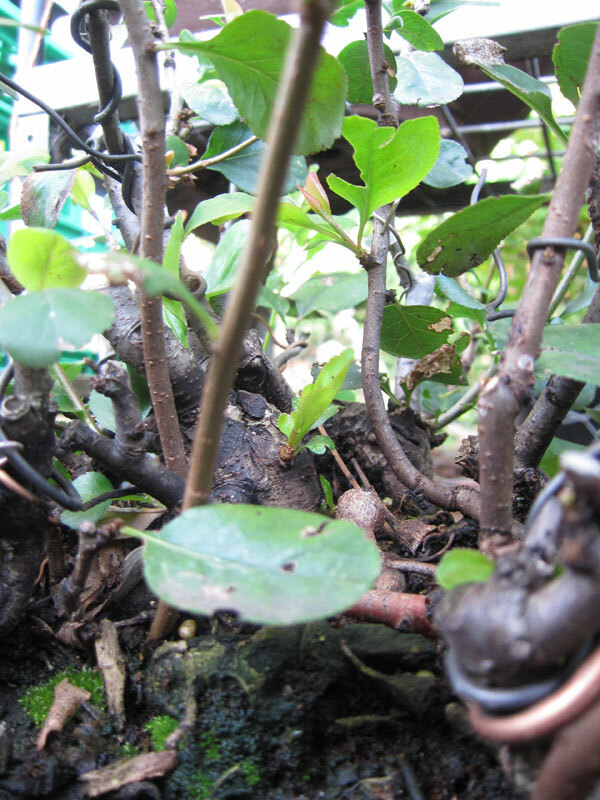 If you are interested in more of the re-potting process you can see the pics from last year HERE. Well, the inevitable happened and another tree has found its way into my collection. While at a friend’s place I spotted the below corky bark Chinese Elm on his sale benches and decided I could make something of it. It had great taper, nice bark, some interesting movement and only a couple very small scars. Another bonus was it was of a size that would see it make use of several pots I have gathering dust on the shelves at home. 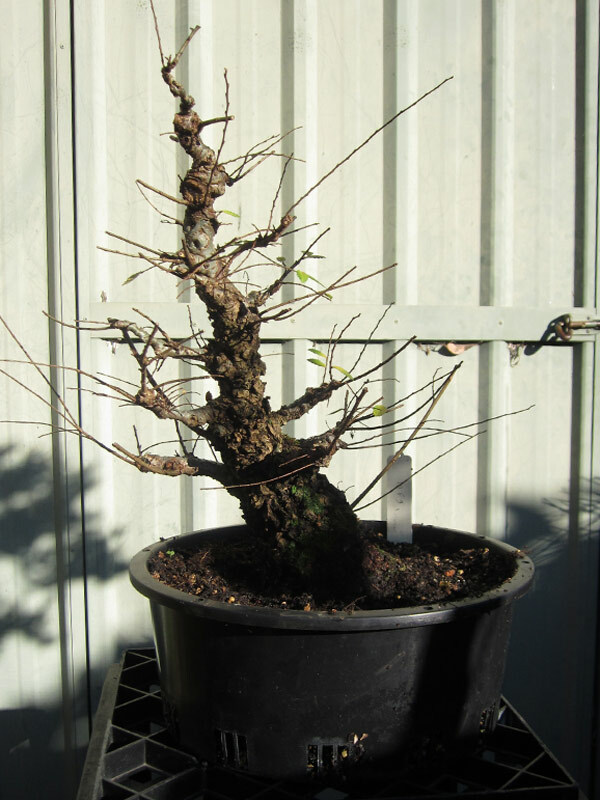 For those interested, the tree is from the same grower that produced my other Cork Bark Elm. The tree as i bought it. Once I got it home I made a few preparations to set it up for next years growth. I cut off the taper-less apex section of trunk which also removed a lumpy section. I then reduced some of the heavy branches and pruned off any shoots that were not going to become part of the future structure. I think in the next few days I will have a go at bending the first left branch down a touch but we will have to see how that goes. 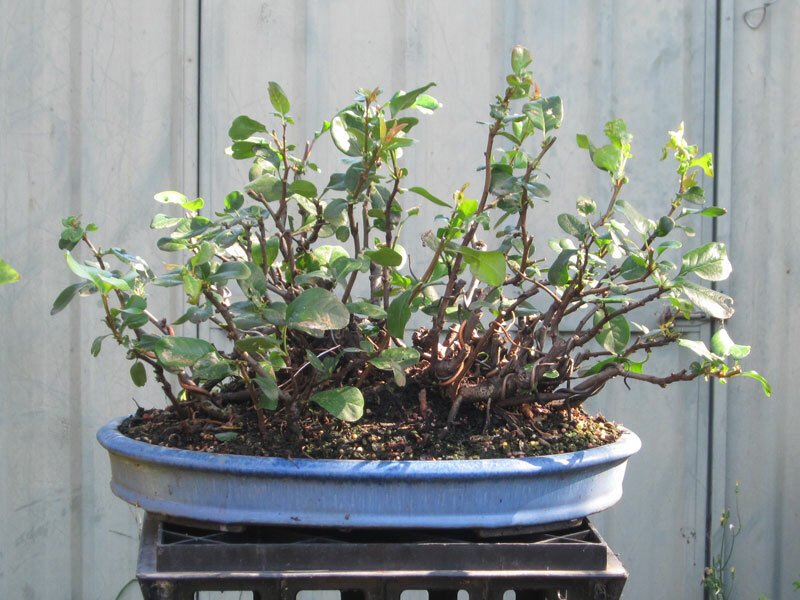 I will probably re-pot it back into this container this year so I can get some fast growth out of it next season. 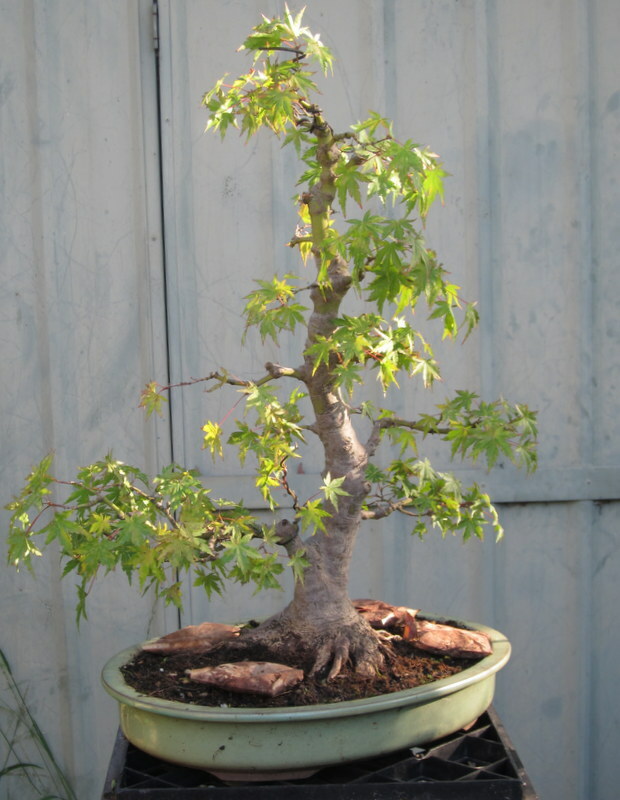 Once I have the main branches and the start of secondary growth set I will pot it up into a bonsai container where I can start the ramification process. For now all it needs to do is grow, especially the new leader. It needs to really thicken up to continue the line of the trunk. 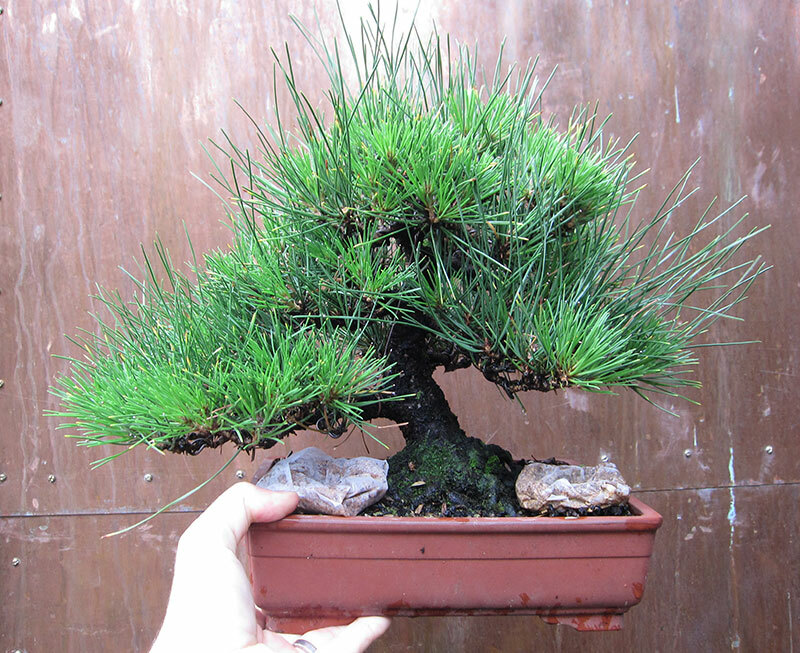 This species is such a strong grower I should have the trunk-line and base branching set after a year.